Landence Group property developers were overwhelmed when their project, The Evermore in South Melbourne, sold 50% of its residences before the launch date. Landence Group property developers were overwhelmed when their project, The Evermore in South Melbourne, sold 50% of its residences before the launch date. Now, in collaboration with Australia’s largest integrated practices of architecture, interior design and urban design, Hayball Architects, Landence Group is due to release a new tower on the 26th and 27th of May. “The East Tower homes will be perfect for owner-occupiers looking to upgrade and downsize, which is phenomenal, really,” says Steve Fairbairn, Sales and Marketing Director of Landence Group. The residences of the new tower will benefit from amenities that mimic the style and quality of six-star hotel features. Some developments opt to separate residents’ lifestyle floors — for example, penthouse owners have access to certain facilities that the buyers of 2 and 3 bedroom apartments don’t. At the East Tower, all residents will have equal entry to the manicured gardens, designed by award-winning landscape architects Tract, and communal lounge spaces, as well as wellness-focused luxuries such as the fitness centre, heated indoor swimming pool, sauna, cinema, and library. 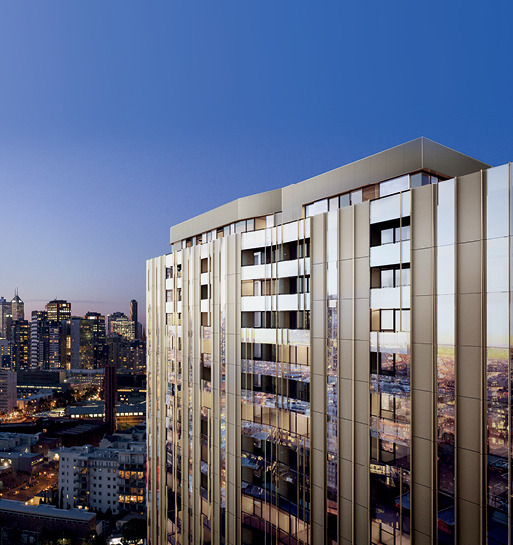 Residents will be living at the junction of Melbourne’s premier arts precinct. The Royal Botanic Gardens and South Melbourne village will be right outside the door, along with hidden bars and boutique independent label retail outlets. There are grocery stores, an amalgamation of different cuisines on offer in local restaurants, and the iconic South Melbourne markets are a short stroll away. The Evermore is perfectly situated to access the best of this iconic area and neighbouring suburbs. Landence Group worked with Hayball Architects to redesign the floor plans of the 2 and 3 bedroom apartments so that they would incorporate more space, a logistical feat considering they had already been designed to be as efficient as possible. “But we managed to squeeze those last few metres in,” Fairbairn laughs. “In addition, there will also be less 1 bedroom floorplans and more 2 and 3 bedroom ones on offer for the East Tower launch. Both companies are passionate about their clients. They genuinely care about how people live both now and in the future while bringing their creative, innovative designs to the table. Partnered together, the result of these powerhouses is a thoughtfully designed and carefully curated masterpiece. The display suites will be launched on the 26th and 27th of May, from 12-3pm at 95 Coventry St, Southbank. Enquire about the Evermore here.